Decadent and indulging, chocolate is also a big mystery. 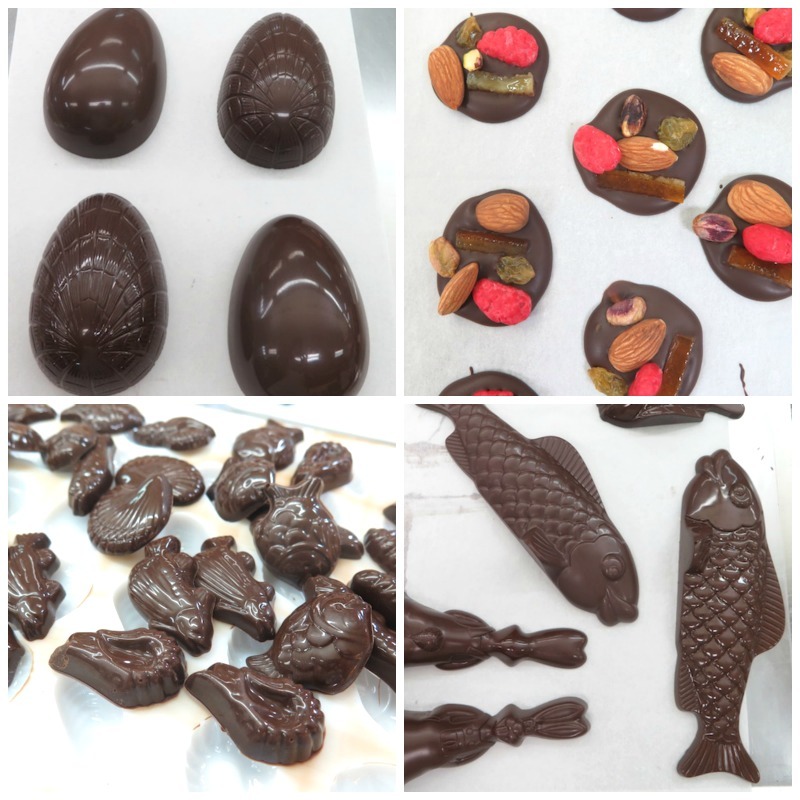 First, the finished products of chocolates we normally lust for in chocolatiers look NOTHING like their origins. From boat-like chocolate pods to the sweet and luscious chocolate truffles, bonbons or chocolate cakes, we eaters usually have no idea about the lengthy journeys each chocolate had gone through before they ended up on the plate. This fact alone makes chocolate-making a pure science in its own right. Since there’s a serious need to be delicious, this science also requires some solid techniques to perfect those chocolates in each variation. 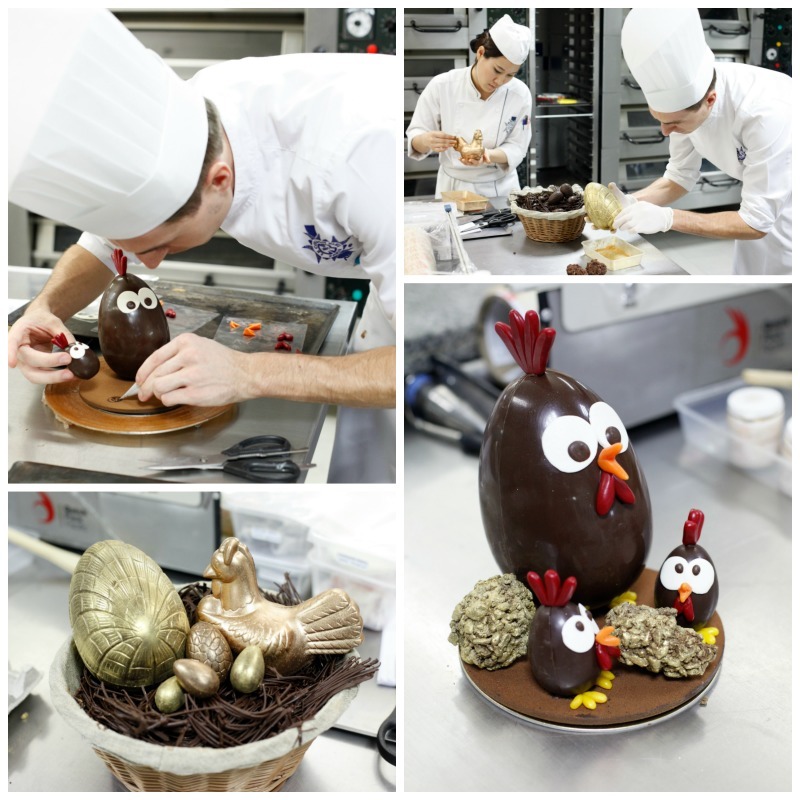 So my short, one-day Easter chocolate workshop at Le Cordon Bleu Dusit Culinary School late last month was a real eye-opener. A delicious, Willy Wonka one. It was the day I got to get my hands dirty, my apron smeared with chocolate while learning a few good things to make me understand why some chocolates are different from others. A short workshop like this could be the day many people interested in getting into the world of professional pastry get to decide for themselves whether the road is suitable for them. I’ll tell you about how the day has gone through. The six-hour, one-day, workshop starts early. Three hours for the morning session, another three for the afternoon. 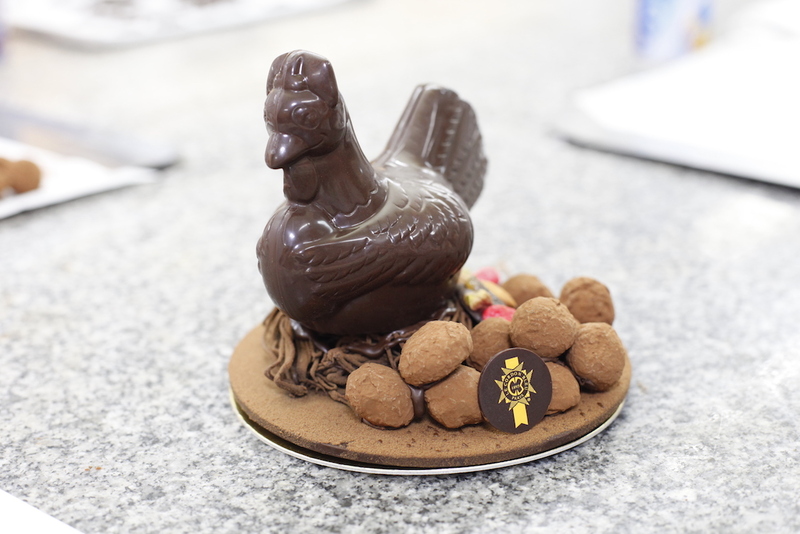 The plan is to make chocolate truffles, chocolate fritures (small pieces of molded chocolates) and a masterpiece of Easter chocolate – all of which the students will be taking home at the end of the day. The class starts at 9am and scheduled to be done by 4pm. The teacher of the day is Chef Marc Champire – Patissier Chef Intructor – whose extensive bio confirms my own suspect that the guy might have had been born with the chocolate wand in his hands. With over 30 years of experience in the patisserie industry, Chef Marc started working at the age of 15. The professional certificate he received later in cooking was only to elevate his opportunities to join forces with worldly names like Pierre Herme, the Carlton, Alain Passard, Froncois Clerc le Traiteur and Lionel Lallement at Meilleur Ouvrier de France (MOF). Chef Marc is not the only one in the classroom. Helping him are Chef Alex Ruffinoni, also a Patissier Chef Instructor and a team of about 5-6 Le Cordon Bleu Dusit’s graduates whose helps range from translating the class to helping each and every student to get their hands and techniques right in each of the steps of chocolate making. Like other lessons, the class begins with the backgrounds of ‘le chocolat.’ As mentioned earlier, chocolate has a long and mysterious story. And that makes it both interesting and intimidating. From chocolate pods hand-picked from a farm in a far, far away place like Madagascar or Cameroon or Ecuador, the raw material is sorted, cleaned, roasted and then extracted into cocoa mass or liquor that can be used to make patisserie. The range of percentages that we see on the bags usually mean the ratios of cocoa solids that the chocolate contain. But then, if you read further, you will find that these percentages can mean different things in different regulations. So, like chocolate itself, the percentage on the bag posts yet another big ambiguity into the already muddy world of chocolate. 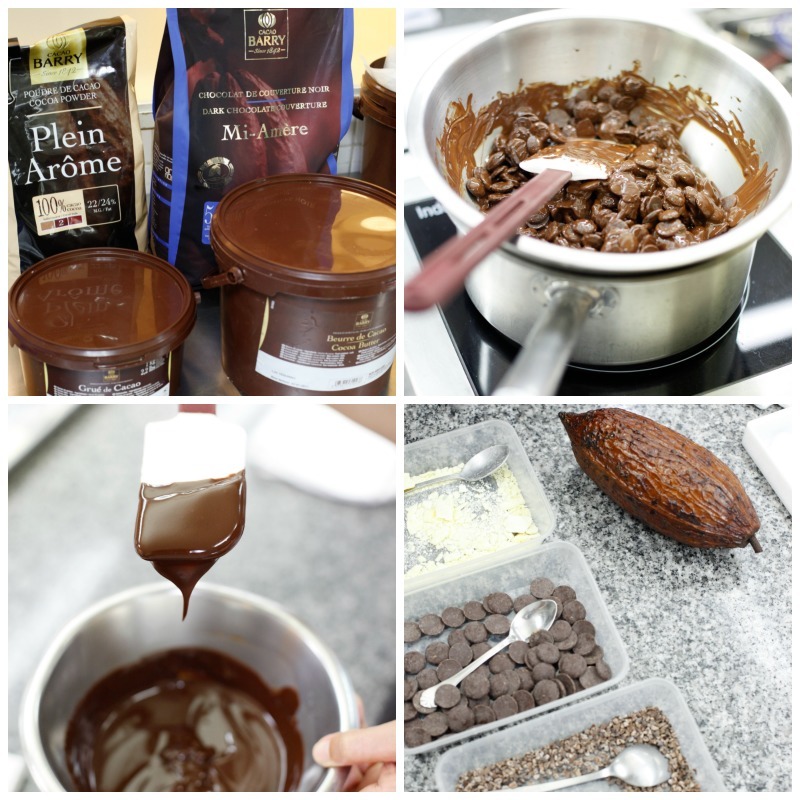 In the class, we use chocolate products from Cacao Barry – who is a partner of the school. I find the website of the chocolate manufacturer quite amazing: full of interesting information about the worlds of chocolate, the cultures of the producing countries and tons of recipes. Since our class will be making molded Easter chocolate, Chef Marc tells us that we need to look for the chocolate that says ‘COUVERTURE’ on the bag. Couverture chocolate is made with the right properties for molding and coating. But if you are making truffles or cakes, other types of chocolate are fine. Forget the simple brownie-making chocolate-melting process, because tempering chocolate requires a whole new level of precision. Tempering is the process of heating – cooling and reheating that will strengthen the molecules of the chocolate. Tempered correctly, chocolate can be constructed into gigantic structures. Next time you see a giant Mickey Mouse made from chocolate, take the time to thank the pastry chefs for their perseverance and preciseness. For Cocoa Barry’s couverture chocolate, the process is like this: melt the chocolate in a bain marie at 45 – 50C, cool it down to 27C and bring the temperature up to 31-32C to process (coat, mold whatever). The ranges of the temperatures also vary from one brand of chocolate to another. 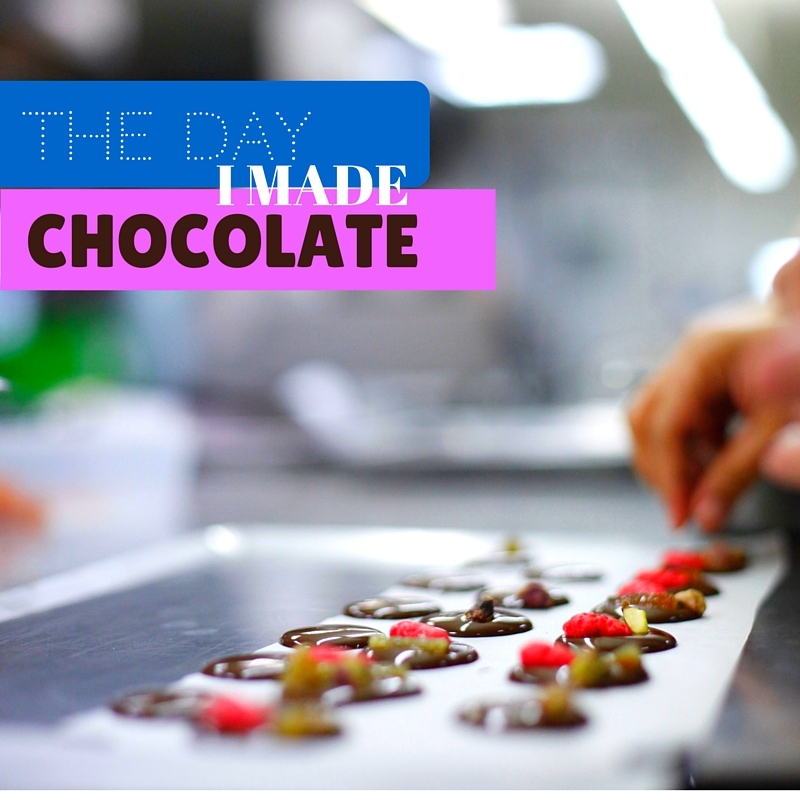 This process of tempering is a crucial step that will make or break your chocolate. Doing it right, you get a shiny, solid product. Sloppy in measuring your temps? you will end up with dull, soft or brittle end products. So pay some extra attention here. And ALWAYS follow the instructions of the chocolate brands and do not EVER take short cuts. Unless you know what you’re doing, of course. Once you have melted and tempered your chocolate, you can make three things: truffles (recipe below), fritures which are small solid pieces of chocolate molded in to mini animals, or in our case, marine animals, and masterpiece of big molded chocolate in fish, rabbit or chicken. There are also other molds, such as eggs, that can be dressed up to be Angry Birds. 1. 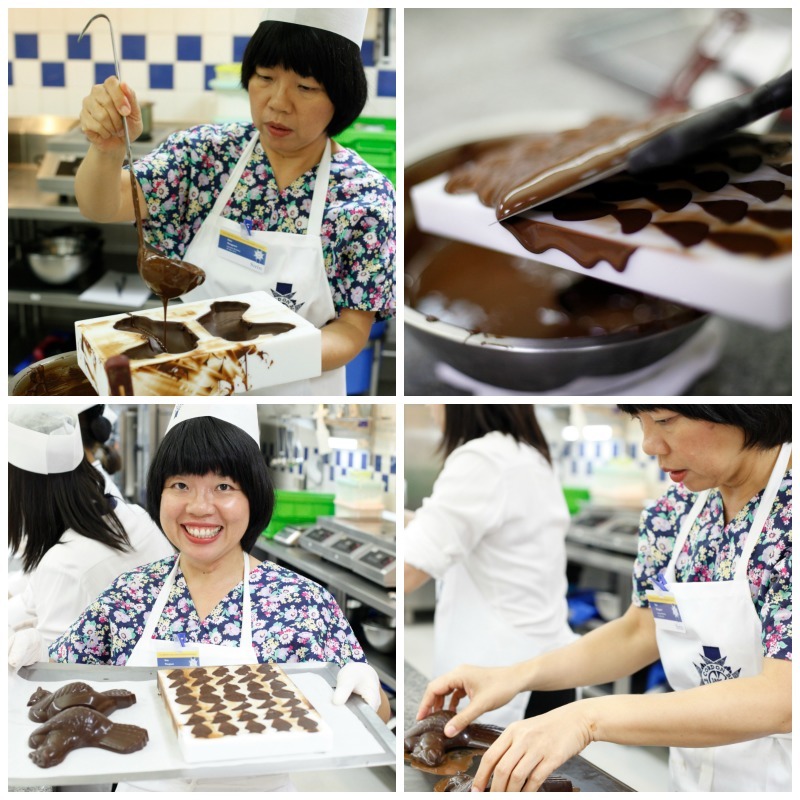 Always follow the tempering instruction according to the brands of chocolate. 2. Use thermometer all the times when tempering. Chocolate is expensive, so do not waste it with sloppy handling. 3. Get all the equipments and tools handy ready to use on the table. You do not want to use your messy hands searching through the cabinets. 4. Start small. Make small batch first, then move on. Once you can master a small thing, you’ll get more confidence to explore bigger thing. 5. If you are to make chocolate at home, turn on the air-con. The room-temperature in this case looks for a range between 24-26C. 6. And the dryer is the better for chocolate. Humidity and water are the biggest no-nos for the ingredient. When tempering, melting or coating, make sure you wipe away the moisture off the bain marie and table and your hands. **chocolate truffles got its name from its truffle-alike looks. Sometimes things are easy and straightforward. 1. boil cream and vanilla together. 2. combine the cream with chocolate and butter, mix well and leave it to cool. 3. make ganache truffles out of the cooled chocolate and chill them in the fridge. 4. once the truffles have been chilled, coat each of them with melted chocolate and cocoa powder. 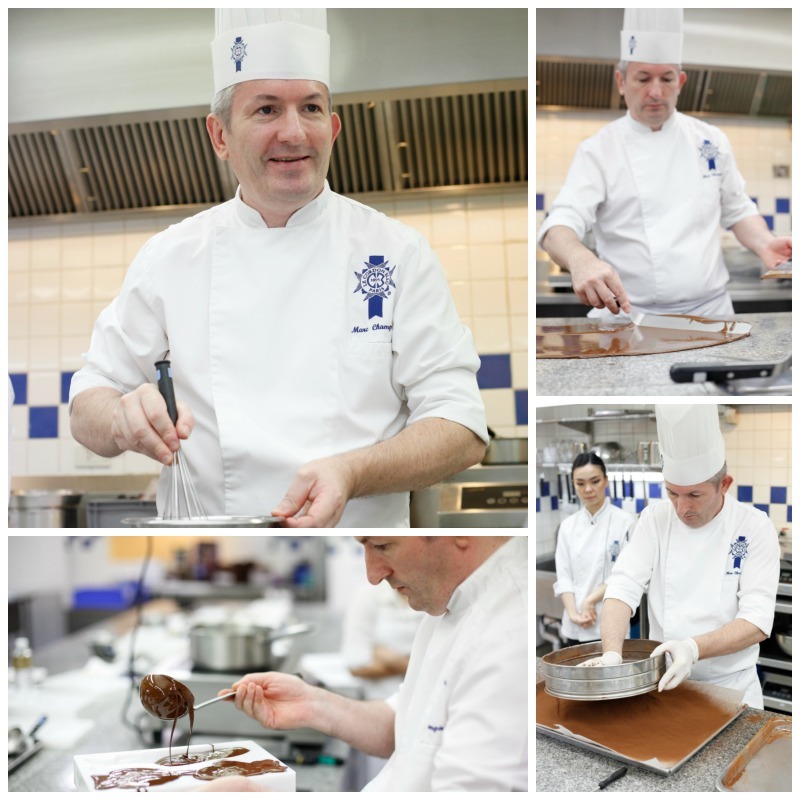 For those interested in spending a day (or days) learning from instructor chefs at Le Cordon Bleu Dusit, you can browse through their programs at their website. 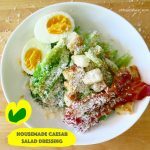 Apart from the usual big diplomas in pastry & confectionary and cuisine (savouries: French and Thai cuisines), they also run short courses in bakery, Danish pastries, Artisan breads, Ice Creams and much more. Also very interesting are their short programs for kids from 8 – 15 years old. That’s my happy mother hen with all the golden luscious and delicious eggs made from the chocolate truffles, wishing you my dear readers the best in everything. 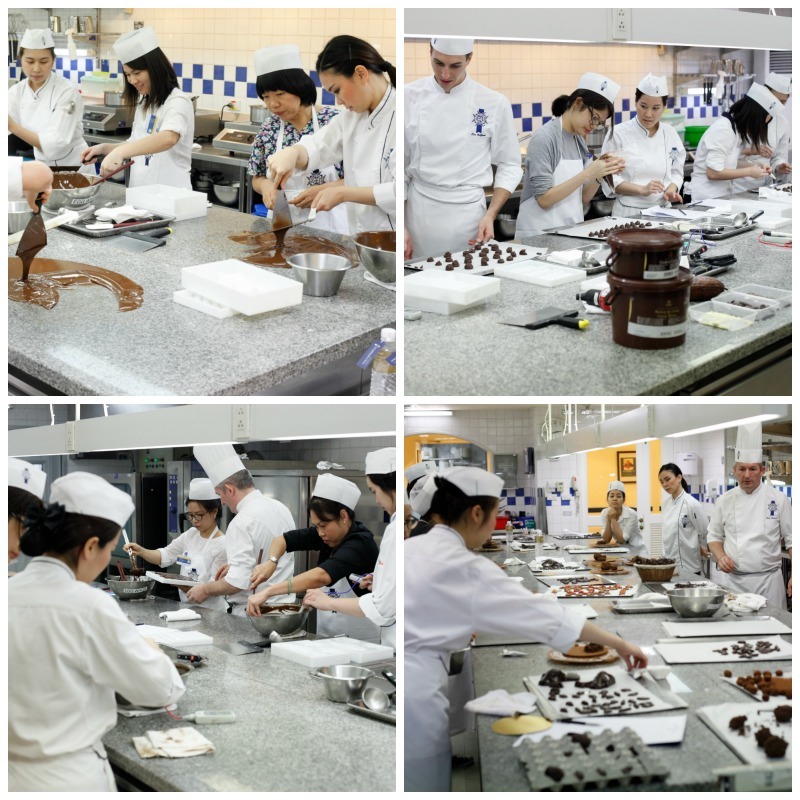 For more information about Le Cordon Bleu Dusit Culinary School, here’s the link to their official website. I am visiting from Calcutta, India 15.06.18 to 20.06.18. Recently, I have started making chocolates at home and selling to mom & pop shops, event management organisations and a few corporates. I would like to participate in the workshop. Kindly inform about the tuition or fee and materials needed.